Dr. John C Petrozza Jr, MD is a Doctor primarily located in Boston, MA. He has 29 years of experience. His specialties include Reproductive Endocrinology and Infertility and Obstetrics and Gynecology. He speaks English. Dr. Petrozza has received 4 awards. The overall average patient rating of Dr. John C Petrozza Jr is Great. Dr. John C Petrozza Jr has been rated by 48 patients. From those 48 patients 22 of those left a comment along with their rating. The overall rating for Dr. John C Petrozza Jr is 4.0 of 5.0 stars. A truly exceptional doctor, easy to talk to, always available to answer questions (he's returned calls at 8 pm at night and even on a holiday), and just a joy to work with. His practice really embodies the group practice philosophy, but I always know that Dr. Petrozza is going over my plan and response. I am in the middle of my first IVF cycle and so far things are going well! Dr. Petrozza is the best! He has a very busy practice, but does his best to arrange phone or Skype visits, and always answers his emails. Several of my friends see him and rave about his bedside manner and the comfortable atmosphere he creates. I was saddened to see a few negative comments about Dr. Petrozza, as I have been following him for the last 10 years and think he is great. People need to know that he is an infertility specialist, a reproductive surgeon, and also has taken it upon himself to see women with chronic pelvic pain, like myself. There is nobody else in New England that has taken on this responsibility. I wnet in to see him demanding surgery, because I thought that is what I needed. I had just undergone surgery a few months before I went to see him, so he was obviously concerned that I hadn't improved. He reviewed all my records and outlined an interesting plan for me. He felt some of my pain was muscular....I though he was crazy. He asked me to trust him for a few months until we completed his recommendations...I once again thought he was crazy. I even posted a comment in another site questioning his method. I had self-diagnosed myself and I was sure surgery was what I needed. Surprisingly, after a few months of physical therapy and trigger point injections, I was beginning to feel better! He also diagnosed me with interstitial cystitis and after starting some treatment for that, I improved immensely. Eventually, he did take me back to surgery, but this time my recovery was better and he felt it was because we had taken care of all the other factors that were contributing to my pain. I think these patient who have written poor comments had expectations that were unreasonable or went in with the wrong mindset. Dr. Petrozza sees my sister and my cousin, and they are both very happy with his care. I will admit that he has gotten more busy, which is why he has other physicians helping him. Perhaps he is not spending as much time with them as he has spent with me. All I know is that he has fixed me, and I am forever grateful. If Dr. Petrozza was not here, who else would see patients like me? Other Gyns just want to operate and then send you away. Dr. P tells it like it is. He has a great bedside manner, tells you what he thinks is going on, and gives you options. I initially saw him for pelvic pain, we did several tests, tried a few simple medical treatments, and I eventually needed surgery. My prior doc said my pelvis was a mess - filled with endometriosis and scar tissue. Dr. P did a laparscopy, cleared things out, and told me to try and get pregnant for the next 3 months. My son is a miraculous gift from what this man was able to do for me. 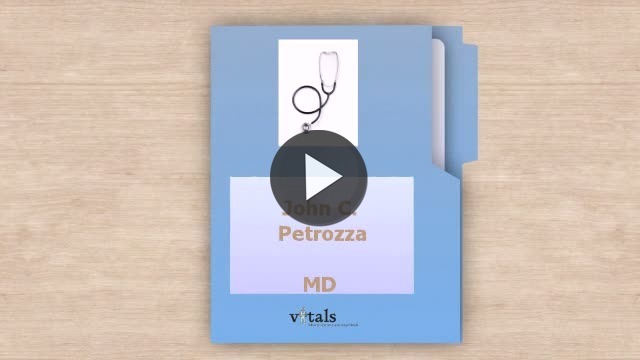 Take a minute to learn about Dr. John C Petrozza Jr, MD - Reproductive Endocrinology and Infertility in Boston, MA, in this video. Dr. John C Petrozza Jr is similar to the following 4 Doctors near Boston, MA. Have you had a recent visit with Dr. John C Petrozza Jr? Select a star to let us know how it was.